Mysteries abound on icy Europa, that cold moon of Jupiter. Even years after the Galileo spacecraft finished its mission in the Jovian system, scientists are still trying to figure out the nature of the cracks on Europa’s surface. In an exciting find, one new paper suggests that at least part of the terrain could be due to plate tectonics. If proven, this would be the first time that plate tectonics have been strongly suggested as a process working beyond Earth. On our home planet, scientists believe that this process, which happens as plates of Earth’s crust move, is responsible for creating mountains and volcanoes and earthquakes. So why do they think this process is happening on Europa? The short answer is, weird terrain. For example, Scientists have seen evidence of what is called extension, which happens when the surface expands and then stuff from the layers below fills in the gap. But there were pieces of that understanding missing until now, the team says. Despite being pretty confident about the extension, scientists were unable to account for how all the new material arrived. 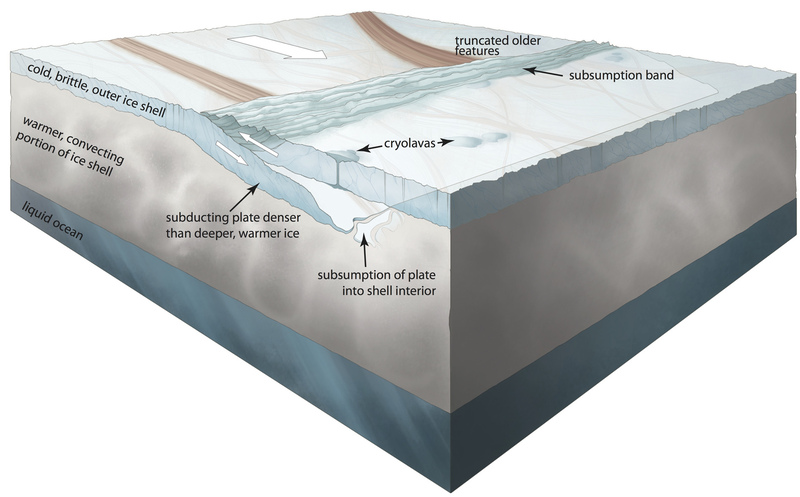 What the team did was try to model how Europa’s surface looked before how all the cracks appeared, and discovered that 7,700 square miles (20,000 square kilometers) couldn’t be accounted for in the high northern latitudes. Looking more closely, they found ice volcanoes that they believe was on a surface plate, and missing mountains in what is thought to be a subduction zone. This suggests that stuff from the surface gets pushed underneath — not crushed into each other. “Europa may be more Earth-like than we imagined, if it has a global plate tectonic system,” stated Simon Kattenhorn of the University of Idaho, Moscow, who led the study. This adds more fuel to the desire of scientists to head out to Europa. NASA has requests out for ideas for a mission to the icy moon, and in late 2013 scientists reported icy plumes erupting from the moon (spotted in Hubble Space Telescope observations). A paper on the new research was recently published in Nature Geoscience. Ice breaks chaotically, so variations in thickness and composition that repeat over long distances should not be expected on Europa. Previous PostPrevious Gliese 15Ab: The Closest Known Super-Earth?